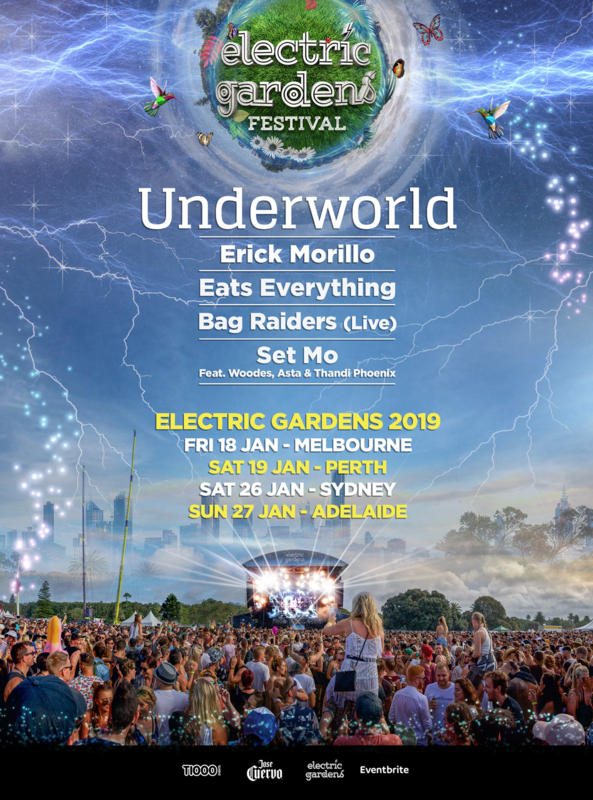 Up to 50,000 electronic music fans across Australia will be able to experience the very best local and international artists from the scene courtesy of T1000 Events, with dance music royalty, Underworld, leading the charge. Recognised as one of the greatest live acts of all-time, Karl Hyde and Rick Smith will be banging out their repertoire of goose-bump inducing anthems including ‘Born Slippy’, ‘Two Months Off’ and ‘Always Loved a Film’. No strangers to headlining the world’s greatest festivals and events, their contribution to the music industry is unparalleled having been handpicked by Danny Boyle to soundtrack the biggest festival of all – the 2012 London Olympics Opening Ceremony. Tickets on-sale 8am Tuesday 2nd October. To find out more and to register for the pre-sale visit electricgardens.com.au.